I don’t like buying things I can make myself, so that’s why I make homemade Mrs. 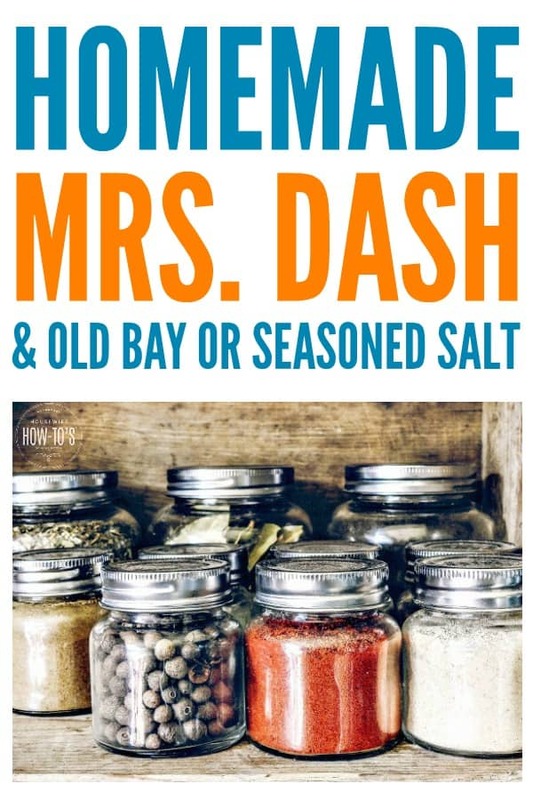 Dash, Old Bay, and Seasoned Salt using the recipes below. It’s not just about the money — I also don’t like artificial ingredients, unnecessary preservatives, and excess packaging. You can call it being cheap, but I prefer to think of it as a smart use of our money. I first got into making my mixes when I learned how to make homemade taco seasoning. Things snowballed after that, and I’ve been making most of our spice mixes ever since. Once you’ve given it a try, you’ll discover how much fresher they taste — and how much kinder they are to your wallet, too! 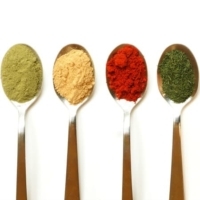 As with all homemade mixes, the flavor of yours will depend on how old your herbs and spices are. If you don’t remember buying that tiny container of mace in your drawer, it’s time to replace it. Be sure you store your spice mixes in air-tight containers to preserve their freshness. A good rule of thumb is to replace whole spices (cinnamon sticks, cloves, peppercorns) every three years, ground spices every two years, and dried herbs every year. Not sure how old it is? Open the container — if it doesn’t smell potent, it’s probably time to buy new stuff. If you haven’t tried Mrs. Dash before, stop what you’re doing! Now, go whip up this seasoning mix and sprinkle it on anything you’d ordinarily flavor with salt. You’ll be amazed at how much heart-healthy flavor this stuff imparts. All of the flavor of the real Mrs. Dash, but you get to control the quality of the ingredients and save money, too. So, although we’re trying to cut the amount of sodium we consume, we’re not about to stop sprinkling it on steaks, burgers, ribs, or chops. This seasoned salt plus some wood chips on the coals add such a fantastic flavor! Or try it on Baked Tilapia with Mediterranean Vegetables. Delish! But I don’t feel guilty about using this liberally. That’s because using fresh herbs and spices means you can cut down on the amount of salt needed. This version contains considerably less sodium than that jar of Lawry’s from the store, but it works just the same flavor magic. Tastes just like Lawry's but with a much healthier sodium count. Combine ingredients in a blender or coffee grinder and whir for 5 seconds. Store in an air-tight container or salt shaker. Ever wondered why your home-boiled shrimp or crab cakes don’t have the same oomph as when you eat at a restaurant? Here’s the reason: Old Bay Seasoning. Now, the store-bought stuff isn’t all that expensive, but since they stash it near the fresh seafood department (and I usually buy frozen), I always forget to buy it. Rather than continue rushing back to the store every time we want a Low Country Boil, I’ve taken to mixing my own Old Bay. It’s so easy to make that I don’t even think about buying the commercial stuff anymore. The must-have ingredient for crab cakes, spiced shrimp, and Low Country boiled dinners! Shake well and shake before each use. Do you have the ingredients list to make Mrs. Dash Fiesta Lime? I can’t find this bottle in the stores. I would be greatful if you can help me with this. Thank You. I don’t, unfortunately. I didn’t even know they made that flavor, but I’ll look for it now! Fiesta lime ingredients are listed on the Mrs Dash home page. small single serving packets it was delicious. So I asked my wife to get me a shaker from the market she bought an assortment of four flavors she thought I might like. What a disappointment all of them absolutely BLAND! i came to the concussion that the product in the individual packets is not the same as in the shaker bottes. It could very well be a different formula, Alejandro, or it could be that the hospital’s food was so awful compared to your wife’s cooking the hospital food needed the flavor help of Mrs. Dash (whereas your wife is probably an amazing cook). Love “Mrs. Dash”. Anxious to try the others. Thank you for being such a sharing and giving person. Will check in on you from time-to-time. My pleasure, Darlene. I hope you find my website useful. I don’t buy celery salt or garlic salt, just celery seed and granulated or powder garlic. Do you know what kind of ratios of salt to spice I would use? I’d hate to have to buy these ingredients just for these mixes. Yay! I am so glad I found this! Was looking for the Mrs Dash post and I feel like I hit the jackpot with three homemade, spice blend recipes!! Win! I’m glad you found it, too. Enjoy! I too will have to cut way back on salt. I was looking for a recipe for Mrs. Dash and thank you for listing one! I’ll be visiting this website often! How frustrating that must be for you since there’s black pepper on everything in restaurants! I hope you enjoy this recipe and that it doesn’t bother your mouth. Love making my own spices — I know what is in there! Great collection – pinned! Thanks so much for sharing on Busy Monday! I love making my own mixes, too. It’s scary what they put in the commercial stuff. Thanks for Pinning! Love this! We already make our own seasoned salt and taco mix, but I love that you posted recipes for Mrs. Dash and Old Bay, too. I agree – why pay more for a store-bought, preservative-filled spice blend when you can make a cheaper, healthier version at home?! Love Old Bay even on chicken. Will be making a batch when my supply is gone!! !